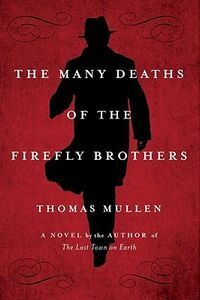 The Many Deaths of the Firefly Brothers by Thomas Mullen, a Mysterious Review. Review: Thomas Mullen's second novel, The Many Deaths of the Firefly Brothers, follows the exploits — and the deaths — of two young men who lead a well-publicized life of crime in Indiana during the Great Depression. Jason and Whitman "Whit" Fireson, known far and wide as the Firefly brothers, are successful bank robbers, their daring crimes documented — and glamorized — by the press. That is until they are shot dead while hiding out following their largest take to date. Much to their surprise, they awaken (come to life?) in the morgue, the blood drying around their multiple, presumably fatal, bullet wounds. They flee, unsure what had happened but sure that their mother, Jason's girlfriend and Whit's wife, need to know they're alive. But staying dead may be more difficult than robbing banks for the brothers, as a second and third death await them. There is the (initially clever) surreal immortality aspect of the principal characters and the parallels drawn between the time period of the story and that of today, but by the third death, the concept becomes derivative, pedestrian even. The book is ably written, to be sure, and the brothers are charming and charismatic characters, but in the end, the plot lacks focus and closure. Despite its interesting and provocative title, readers expecting a mystery, suspense or crime novel may well be disappointed. Acknowledgment: Random House provided a copy of The Many Deaths of the Firefly Brothers for this review.